of your life. Take a deep breath and enjoy the best offers from mountains to lakes - and everything in between. For nature enthusiasts, adventurers and those just wanting to take a break from everyday! The Kornock loves bikers, and bikers love the Kornock. Why? Because we are located amidst the mountains and offer fantastic ready-prepared tours for you to explore either fully guided or individually. Enjoy the breath-taking scenery while riding the very best motorcycling routes including the Three-Country Tour, Nockalm Road and Grossglockner Tour … And because we provide a range of facilities to make you and your bike happy: covered bike parking area, additional drying room, wash-down area for your bike, tour maps and much more. Hot tip: our annual biker meeting. Mouthwatering feasts Mountain air makes hungry. We serve the best solution: dining in style with a great selection of comfort dishes. Whether barbecue evenings on the terrace, fried chicken feasts, fondues or our latest hit, tapas in the pan - give yourself a real treat and join us at the K-Alm! By the way, we accommodate your special diet requests with ease and serve vegan, lactose and gluten-free specialties. After all, we want you to be well fed and happy. Already heard? The stone pine wood’s beneficial effects on the human organism have been valued for centuries. The wood’s essential oils are not only wonderfully fragrant but also promote deep and relaxing sleep. Experience it for yourself in our stone pine rooms furnished with a love for details. 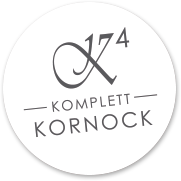 At the Kornock, all good things come in fours! Just think of the lucky clover! So it only makes sense that we present our four favorite spots: K-Mountain, K-Alm, K-Hotel and K-Stadl.